Manchester United were not a good soccer team last season — and they haven’t been for four or five years running. For a while, that didn’t stop them from winning. The end of Sir Alex Ferguson’s tenure was marked by the outsize performances of under-talented squads, but when he handed the same team over to David Moyes, the magical carriage turned into a seventh-place pumpkin. With Moyes ousted after one season, Louis van Gaal came in, and the great United rebuild began anew under the urgent mandate to return to the top four and Champions League in any way possible. In typical United fashion, they finished fourth, but they did it on the back of results that outstripped the quality of their performances. There was a parade of weird flukes and games when almost every United shot found the back of the net. Getting consistently outshot is no way to go through life if you expect to be a Champions League team, and yet United managed. With the club’s sights now set far beyond a fourth-place finish, you’d figure that would have to change, but they’ve kicked off this season in the same way: getting three points from a somewhat dull, somewhat fortunate 1-0 win against Tottenham Hotspur. So, one week in, the question remains: Will United finally become a team that succeeds because of its performances and not in spite of them? There was one big issue with Manchester United last season: They could defend, and they could attack, but they could never do both at the same time. Now, some of that comes down to the roster van Gaal inherited. Typically, center back is one of the more constant positions on a roster, but six center backs topped 10 appearances last season for United: Chris Smalling, Jonny Evans, Phil Jones, Paddy McNair, Tyler Blackett, and Marcos Rojo.1 Michael Carrick, a center midfielder, filled in occasionally on an emergency basis, and in Saturday’s game, Daley Blind started in the middle of the defense. If any of these players were particularly good — or able to stay healthy — they’d likely have gotten a more concrete hold on the job. Instead, van Gaal was left to mix and match for the first half of the season, sometimes employing a back three with the hopes that three mediocre defenders could do the job of two good ones. The result was a team whose performance vacillated from completely impotent to hysterically open, and it took months to approach even basic competency. As the season wore on, van Gaal eventually settled on a 4-3-3 system that relied heavily on protecting his defenders by keeping the ball away from his opponents. The new approach, combined with some phenomenal and perhaps unrepeatable goalkeeping from David De Gea,2 settled the defense but left the attack broken, as United struggled to create scoring chances from open play. Again, some of this was personnel driven: Robin van Persie frequently looked like an immobile shell of his former self, and new signing Radamel Falcao looked like a shell of a shell of his former self. At best, both were stationary targets who could sit in the box, pounce on opportunities, and not do much else. At worst, they were active liabilities. The issue went deeper than the strikers, though. With United’s second-half-of-the-season approach centered on a midfield devoted to possession, it meant fewer dangerous runs into the box and more waiting back to recycle possession. It also meant safe passing instead of aggressive balls upfield. Despite attempting the third-most forward passes and the second-most total passes of any team, United attempted only the eighth-most forward passes in the middle third.3 Some of the best midfielders on the roster had thrived when given the freedom to roam all over the field, and they were stymied by the system. Ander Herrera eventually learned to adapt and finished the season in the starting 11, while Ángel Di María, who was probably the most talented player on the roster, never did and was shipped off to Paris a few days before this season began. Thanks to the wholly conservative midfield, all the creative pressure fell on the front three of Ashley Young, Wayne Rooney, and Juan Mata. With that trio settled as starters — and with the added wrinkle of hoofing the ball up to Marouane Fellaini, who functioned as a makeshift target man/attacking midfielder toward the end of the season — United were fifth in the league in shots. (They were seventh overall.) That’s fine and maybe even acceptable for a team hoping to challenge for fourth place, but it’s not good enough for a team that expects to be in the Champions League every season and challenge for a title. Falcao and van Persie are gone, and while that’s good news, it leaves Rooney as the only option at striker. Two weeks ago, van Gaal bemoaned the current team’s ability in the final third. When he says “creativity,” he doesn’t mean “freedom of movement.” He’s not talking about a guy like Di María wrecking defenses by popping up unexpectedly all over the midfield and breaking into space. Rather, he wants a winger who, in this very structured formation, can get the ball in a one-on-one situation, demolish a defender, and bring down the walls of a set defense. On Saturday, that was Young’s job, but unfortunately Kyle Walker, Tottenham’s right back, took him to school. Now, this isn’t a small problem for United. It’s at the center of their attacking issues. Getting a winger isolated against a defender is a huge win for an attacking side, but it’s only the first part of a process that leads to creating a quality chance. As we also saw last season, when Young wasn’t losing the ball, he was lobbing it toward a couple of static players standing in the box. If it’s to be consistently dangerous, van Gaal’s system needs Young to beat his man off the dribble, so it’s doubtful he’ll end up being the answer. Presumably, van Gaal brought in Memphis Depay,4 the 21-year-old attacking phenom from PSV Eindhoven, to fill this role, but that didn’t happen on Saturday, either. He played centrally behind Rooney as the most advanced midfielder. It’s understandable to want to use him through the middle, where in theory he can influence the game more by drifting to either side of the field or combining with Rooney to open up space and run at defenders. 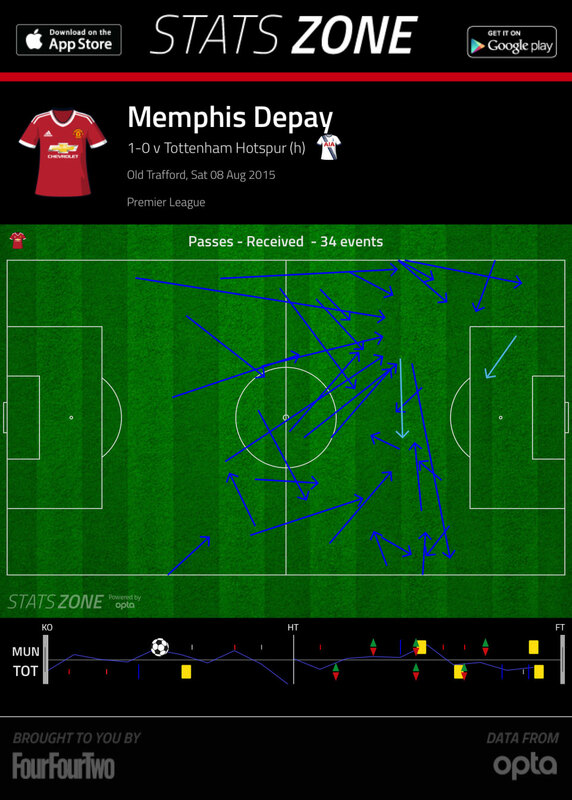 Against Tottenham, though, Memphis wasn’t able to escape his duties to the ball-recycling midfield machine: Despite receiving 34 passes, he was the end of only one ball in the penalty area. On Saturday, Carrick and summer arrival Morgan Schneiderlin slotted into the central-midfield roles behind the young Dutchman. On paper, the Memphis-Michael-Morgan trio folds together nicely — respectively an attacker, a holder, and a jack-of-all-trades — but against Tottenham, their performance mirrored last season’s approach, one that saw conservative possession trump aggression. Ideally, Schneiderlin, in particular, will eventually free up his midfield partners to roam more freely than van Gaal allowed last season. The point of the conservative midfield is to protect the subpar defense, and while the defense hasn’t changed — apart from the arrival of right back Matteo Darmian — that doesn’t mean they can’t at least appear to be improved. At Southampton, Schneiderlin presided over one of the Premier League’s best defenses for the past few years — and that’s within a conveyor belt of new managers, new tactics, and new players. Center back Dejan Lovren played behind Schneiderlin and then earned a big-money move to Liverpool, where he played behind an aging Steven Gerrard for a year and promptly looked awful. A great defensive midfielder can magically make his center backs look better, and United will be hoping Schneiderlin can do the same for the likes of Jones and Smalling. The club also brought in Bastian Schweinsteiger, the just-past-his-peak international superstar, and it’s easy to picture him, Schneiderlin, and either Herrera or Memphis forming a still-solid but also more mobile and dangerous midfield unit this season. But one game in, it’s not at all clear that a more-progressive midfield is actually what van Gaal wants. With Saturday’s starting three — plus Herrera, Blind, Schweinsteiger, and Fellaini — van Gaal now has plenty of options. He could be working toward an established pecking order that we’ll see soon enough or maybe flexibility is the ultimate goal, and he’ll be content to mix and match from game to game. However van Gaal deploys this unit, United’s midfield, with its top-end talent and extreme depth, should become the team’s biggest strength. Despite a three-year transfer binge that’s seen the team spend north of £200 million, this is still a team with obvious holes at striker, the coveted attacking winger slot, and center back. Part of that is a knock on some of the club’s unrealized recent purchases, but it’s mostly a testament to both how Ferguson papered over a crack-laden roster in his final years and what a terrible job he did at filling them for the future. This season, the goal for Manchester United is to win the Premier League. How close they get to it will depend on how they leverage that deep and talented midfield. If they find the creative piece — whether via a transfer or first-year magic from Memphis — to make their attack succeed as currently designed, then the midfield will be able to continue on as an engine for ball retention and added defensive muscle, and they’ll contend for a title right now. If not, then it’s up to the manager to generate that creativity himself. Last season, that meant almost exclusively throwing Fellaini in and trusting in the power of his chest control. This season, van Gaal should have plenty of alternatives. Against smaller teams, maybe Fellaini gets to play the bully, but in other weeks the pairing of Schweinsteiger and Schneiderlin could allow Herrera or Memphis more freedom to roam to their heart’s content. Or if an opponent wants to press, Carrick, Blind, and Schweinsteiger could all play together, giving van Gaal the confidence in his players to allow them to pass through the middle. The mix-and-match approach might not generate the kind of consistently dangerous attack needed to win a title, but it’ll at least raise the team’s ceiling from last season. Manchester United still aren’t a complete team by any means, but for the first time since Alex Ferguson left, we can see the path toward becoming one. They’re a work in progress, but at least the progress is finally beginning to show. A portion of Rojo’s appearances came at full-back, too. De Gea sat out Saturday’s game ahead of a possible move to Real Madrid, so he may not be around for long. All stats via ESPN Stats & Info. He’s asked to just go by “Memphis” and doesn’t wear his surname on his jersey.